Taken from Little Aran & Celtic Knits For Kids: "Knit this childrens accessory beanie hat from Aran & Celtic Knits for Kids. A design by Martin Storey using the gorgeous yarn Felted Tweed, this knitting pattern features a two-tone stripe and birds-eye Fairisle combination." 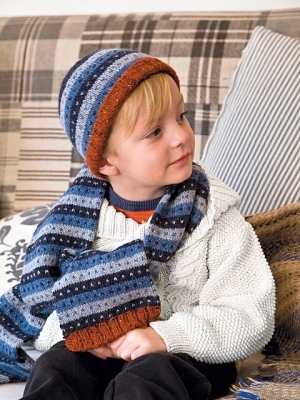 This pattern is from Little Aran & Celtic Knits For Kids, pg 129 - Norse Scarf. Size US 3 straight needles and US 5 straight needles (or size needed to obtain gauge) are required but not included. Finished Measurements: 5 (5.5, 6, 6.25)" x 13 (14, 15, 16)" after blocking. Gauge: 23 sts and 28 rows over 4". Color Shown is Scree, Seafarer, Maritime, and Ginger.